ROpenSci offers nice R language bindings for the PLOS (I'm more used to PLoS but I'll go with it) API, called rplos. There's no particular reason to limit the search to PLOS journals but rplos seems significantly more straightforward to work with than pubmed API packages I've used in the past like RISmed. 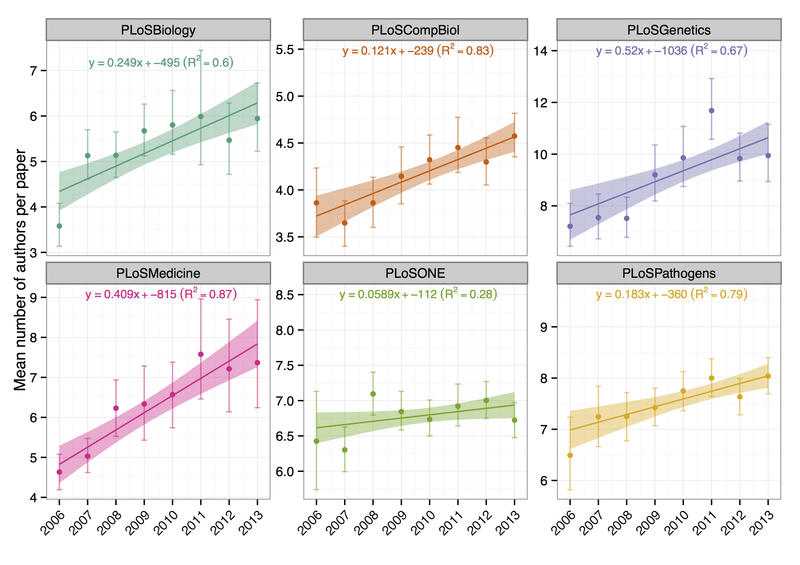 A downside of using the PLOS API is that the set of journals are quite recent, PLOS ONE started in 2006 and PLOS Biology was only a few years before in 2003, so it'll only give us a limited window into any long-term trends. Above I've shown yearly means plus their 95% confidence intervals, as estimated by a non-parametric bootstrap method implemented in ggplot2. Generally from this graph it does look like there's a slight upward trend on average, though arguably the mean is not the best summary statistic to use for this data, which I've shown is not normally distributed, and may better fit an extreme value distribution. 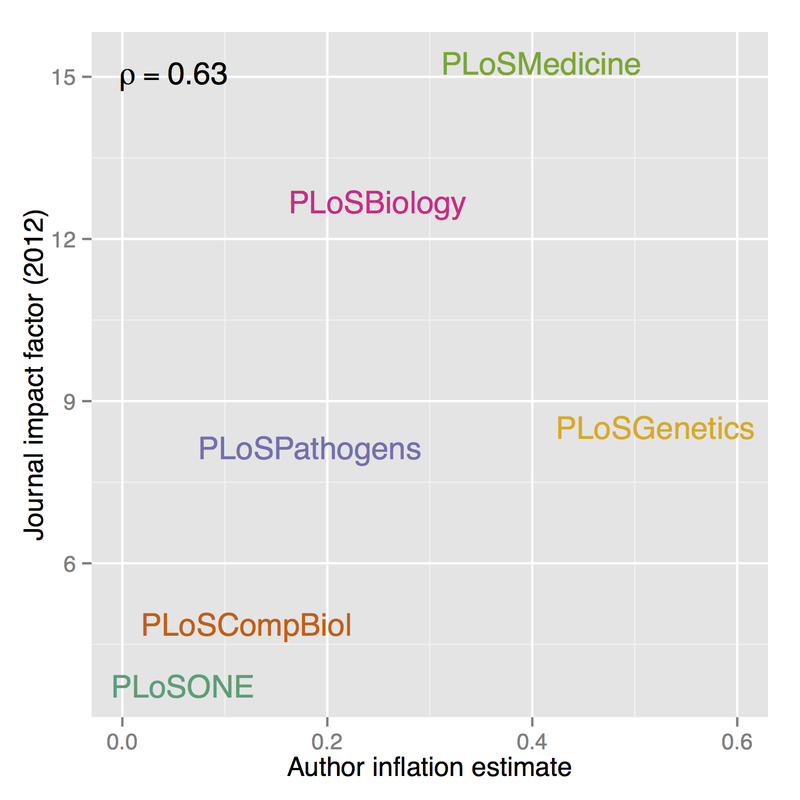 It's interesting to speculate on what drives the observed differences in author inflation between journals. A possible covariate is the roundly-condemned "Impact Factor" journal-level metric — are "high impact" journals seeing more author creep than lesser publications? If estimate of author inflation is plotted against respective journals' recent impact factors, there does indeed appear to be a positive correlation. However, this comparison only has 6 data points so there's not enough evidence to reject the null hypothesis that there is no relationship between these two variables (p = 0.18). I don't know, but I'd lean towards probably not. 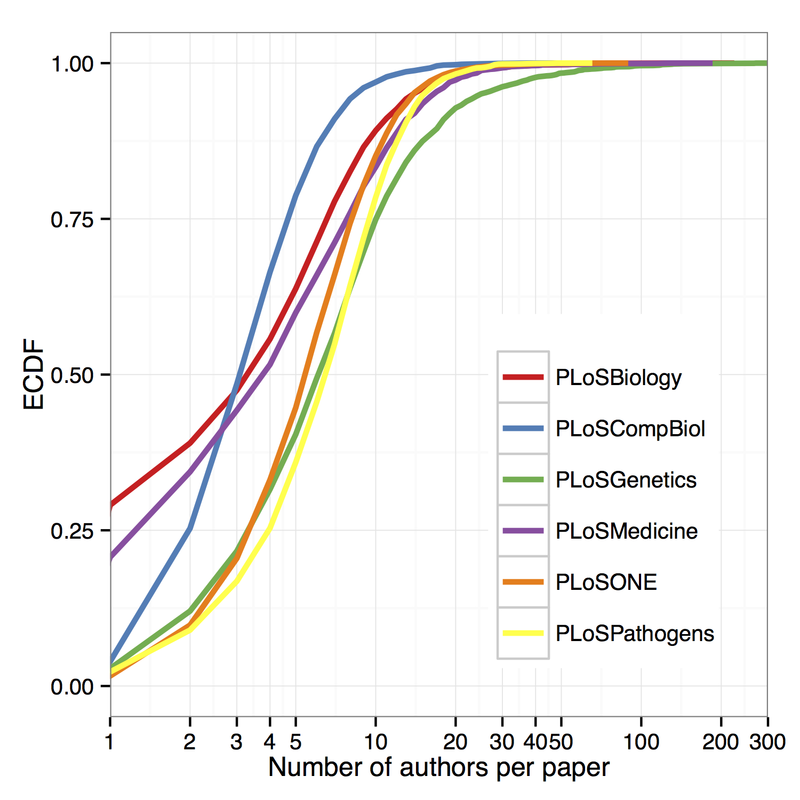 The average trends could be reflecting the proliferation of "Big Science" with huge collaborative consortiums like ENCODE and FANTOM (though the main papers of those examples were targeted to Nature) and doesn't necessarily support a conclusion that Publish or Perish culture is forcing lots of token authorships and backhanders between scientists. 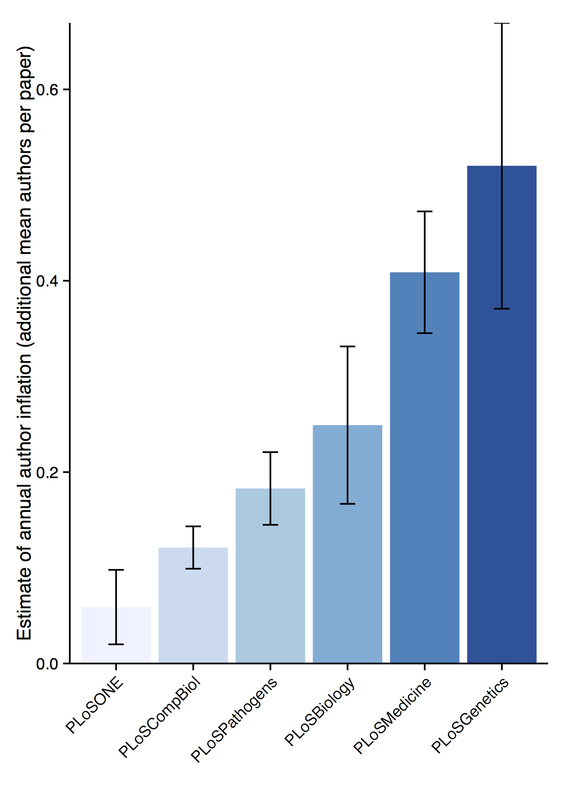 Means used for regression — while we get a surprisingly high R2 for regression the mean number of authors per paper per year, the predictive power for individual papers unsurprisingly vanishes (R2 plummets to between .02 and 4.6 × 10-4 per journal — significant non-zero coefficients remain). Author inflation wouldn't be expected to exhibit consistent and pervasive effects in all papers, for example reviews, letters and opinion pieces presumably have consistently lower author counts than research articles and not all science can work in a collaborative, multi-author framework. Search limits — rplos returns a maximum of 1000 results at a time (but they can be returned sequentially using the start and limit parameters). They seem to be drawn in reverse order of time so the results here probably aren't fully representative of the year in some cases. 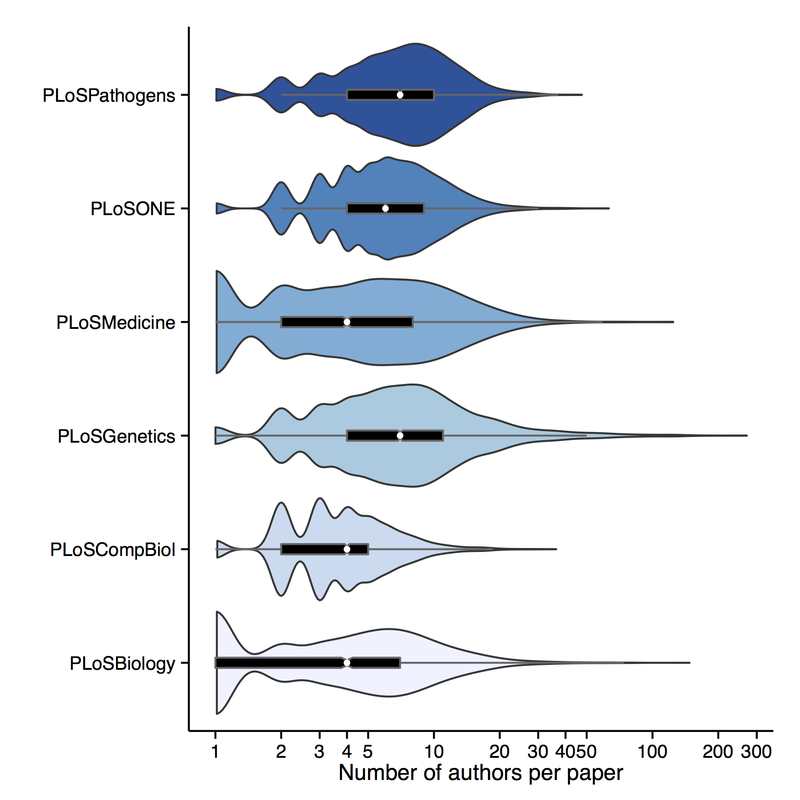 This has also meant my sample is unevenly split between journals: PLoSBiology: 2487; PLoSCompBiol: 3403; PLoSGenetics: 4013; PLoSMedicine: 2094; PLoSONE: 7176; PLoSPathogens:3647; Total: 22,460. The full code to reproduce this analysis is here.